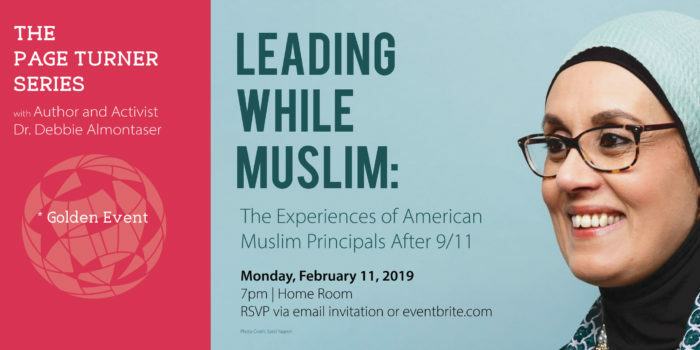 I-House Page Turner Series Presents: Leading While Muslim: The Experiences of American Muslim Principals After 9/11 by Debbie Almontaser. Please join us for a very special book event with author Debbie Almontaser as she shares her thoughts on the adversities that American Muslim principals have experienced post-9/11 and how to address these adversities, particularly through decisions about educational policy and district leadership. Synopsis: Leading While Muslim is the first of its kind to study Muslim principals in the United States. There has been a sizable amount of research on how 9/11 has had an impact on public school communities, including students, teachers, and parents of Muslim identity, but nothing on American Muslim principals in public education. This book examines the lived experiences of American Muslim principals who serve in public schools in a post-9/11 world to determine whether global events, political discourse, and the media coverage of Islam and Muslims have affected their leadership and spirituality. *Book signing will follow a moderated discussion with Debbie Almontaser.